Power Rangers Review | Nerd Much? Power Rangers is one of those pop culture staples that while not always relevant to a particular year, is something that pretty much everyone universally understands the very basics of the show. This is mainly due to the extremely popular show from the 1990s, Mighty Morphin Power Rangers, that catapulted this once Japanese series into a global phenomenon. Now decades and several hit or miss movies later, Hollywood is aiming to give these five heroes the full Hollywood treatment with a big blockbuster film. While it’s easy to scoff at the idea, especially given how terrible adaptations of toys and 90s properties have been lately, Power Rangers was way more fun than I expected. Before we begin, it’s important to understand that Power Rangers is not amazing, or even great but just good. It’s serviceable in terms of action and characters, despite having a few rather noticeable missteps along the way. No, this is not the next Transformers franchise destined to mar whatever perception we will have of the franchise for years to come. It’s an entertaining action movie that is around just long enough before overstaying it’s welcome. Following the story of five misfit kids in the town of Angel Grove that all have their own share of problems whether it’s social or mental. 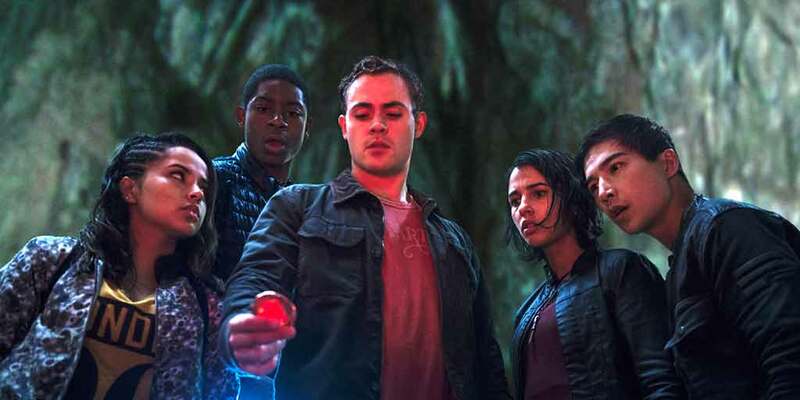 After the hometown hero Jason (Dacre Montgomery) is disgraced via a prank gone wrong, he’s sent to detention where the young man meets Billy (RJ Cyler) who drags him along during an expedition to a quarry. One thing leads to another and eventually the duo accidently join up with Kimberly (Naomi Scott), Trini (Rebecca Gomez) and Zack (Ludi Lin). The group accidently find some mysterious artifacts and are granted super speed, strength, and endurance. A mysterious figure known as Zordon (Bryan Cranston) informs them that they are the Power Rangers and are destined to destroy the evil Rita Repulsa (Elizabeth Banks). It’s all very silly, but director Dean Israelite understands this and decides to lean into the wackier and more absurd moments of the story. Don’t expect a film that is full of gritty moments or commentaries about the nature of being a superhero. This works in Power Rangers favor thanks to the excellent chemistry among the five leading stars, all of which play off each other wonderfully. There’s a real sense of friendship between the actors and it translates onto the screen with ease. Each of them is defined through various backstories and personalities that get a surprising amount of exploration. While every one of the five Power Rangers gets some backstory flushed out, the two real stars of the show are Billy and Kimberly who make up more of the moral arcs throughout the film. Much of Billy’s success comes from Cyler who gives a wonderful performance as this young man who is on the Autism Spectrum, yet the idea never feels forced into the plot. It’s a trait that enhances our understanding of the character and Cyler does an admirable job of making Billy exceptionally likable. Kimberly, on the other hand, makes up more of the traditional character arc, as she works to move past her own demons while embracing the new friends she has. There’s some clunky dialogue, sure, but most of it is delivered with such earnest you can’t help but crack a grin. Making up the bulk of the humor is Alpha 5 (Bill Hader) who is actually quite funny, as most of his lines are delivered with a rather dry wit. He doesn’t steal the show, but his presence makes what could be exceptionally cliche training sequences fun. Sadly, where Power Rangers loses some steam is when it comes to the villain, as Rita is just not that interesting. She has a history with the likes of Zordon but it’s never given enough time to truly add the emotional weight needed for the role. While Banks is clearly having fun, Rita is way to one dimensional when propped up against the Rangers or even Zordon. This goes for her beats as well, all of which lack anything truly iconic or interesting about them. They aren’t nearly as memorable as the Power Rangers’ villains should be and simply act as an excuse for everyone to show off their fighting moves. Which, also to my surprise, was kind of lacking for a series best known for the zany fights. There are a few “Action” scenes in the film, but most of the real fighting is reserved for the last thirty minutes or so. When it all gets going, the sight of seeing five Zords charge into battle to “Go Go Power Rangers” will make even the most skeptical fan giddy. However, this isn’t enough to save it, as the Megazord is in the movie for a whopping 10 minutes and really is not as epic or awe-inspiring as one would hope. Thankfully, all of the action is shot competently and is absent of a shaky cam, which makes following all of the chaos fairly easy. The score for this film is a bit odd as it mixes both orchestral and actual songs, some of which fit and some just feel super out of place. Some of them are just cut short and hearing Kanye West’s lyrics blaring in the background of a big action sequence doesn’t help elevate the combat. You have to turn your brain off for Power Rangers and while that may sound like an insult to the filmmakers, it’s once you embrace the cheesy, insane moments that it all clicks together. 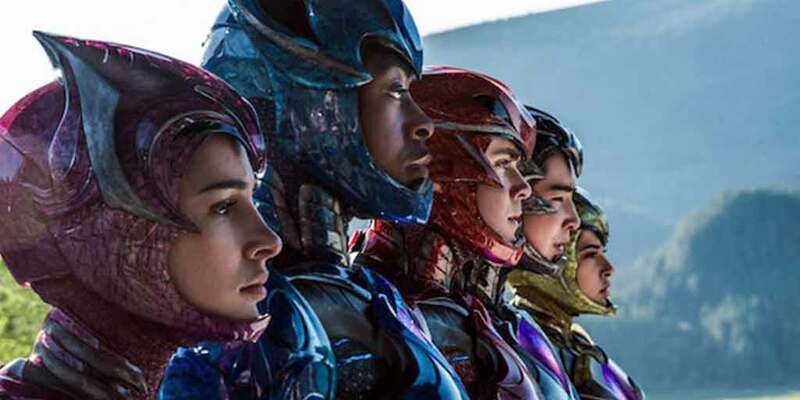 There’s a lot of heart in this Power Rangers movie — more than one might expect where giant robot dinosaurs are on the menu. However, thanks to the great character development, fantastic chemistry, and solid (yet rather traditional) story, Power Rangers succeeds. Even though Rita and a lack of action may disappoint fans, this is a worthy starting point for this franchise. Despite not being perfect, Power Rangers is a damn fine start to what could be a very successful series.